What is a home without children? Quiet. 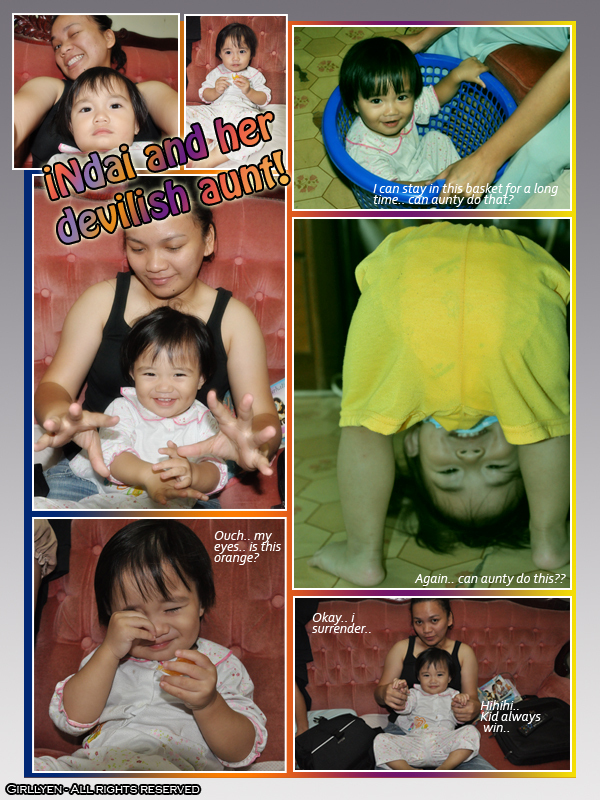 I was browsing my old photos and caught some of the photos with Indai aka Charlotte Grace, daughter of Calvin & Olivia my cousin. All the photos were taken on 24/01/2009, look at the post Make Myself Happy, she is growing fast! May God bless their family with the appearance of Indai. 😉 Love all the innocent kids! However, kids cannot be trusted nowadays. This message are brought to you by Girllyen.com. Photography is Art and Art is Infinity. my cuzzy punya anak.. heheh.. ada datang tu hari time the engagement juga ni.. dia lah tukang kasi habis tu cupcake i think.. hahah..
Punyalah cute hehehe. ada lagi di dalam bakul hehehe.